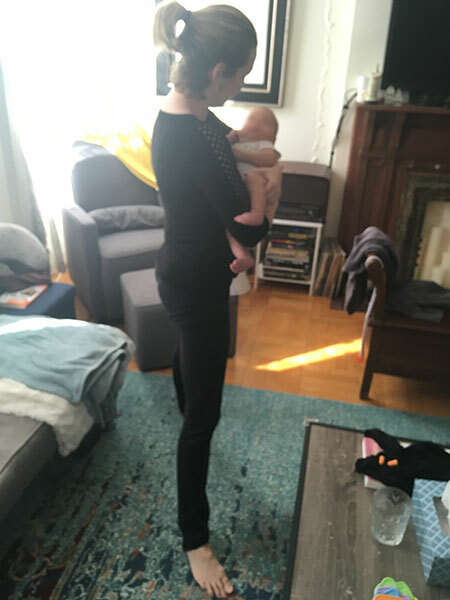 This post is for caregivers of all types: parents, grandparents, aunties, uncles, babysitters…everyone can benefit from some body mechanics awareness! What is the best way to put a baby down for a nap? Try and get as close as you can to the crib. In this photo notice how my knees are touching and bracing the side of the crib. If I get as close as possible, it creates a shorter lever arm at my back. The longer the lever arm, the more chance of back pain! Notice in this picture that my legs are further away from the crib and my knees are straighter, which is putting more pressure on my back. Perhaps the best option for preventing and managing back pain is also best for managing tight real estate. 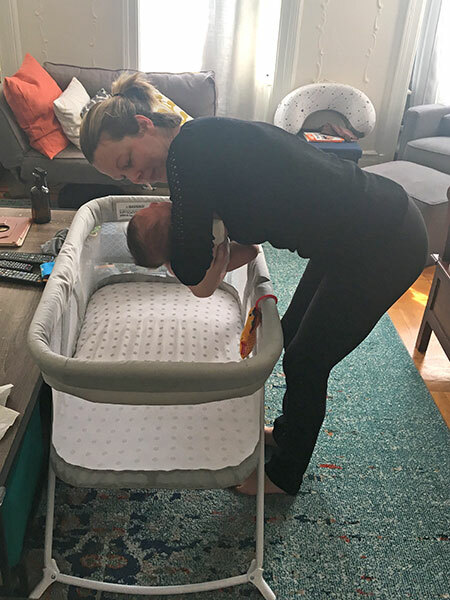 If you can get along side of the crib with your feet wide and knees bent, you’ll be able to slide the baby in sideways with less pressure on your back. 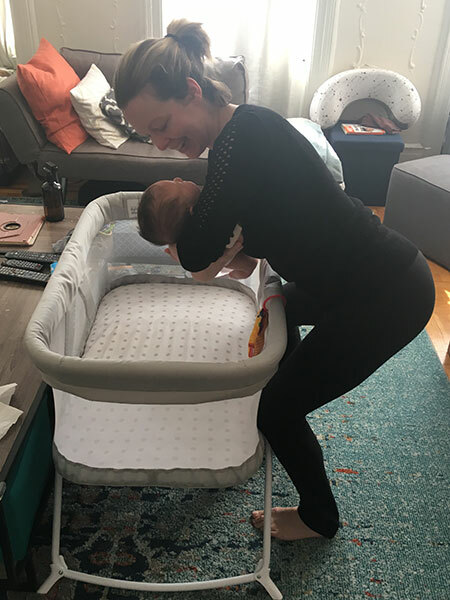 You may not be able to tell, but my left leg is touching the foot of the crib and my abdomen is right along the crib rail, supporting my spine as much as possible. Many caregivers develop sore and painful wrists and forearms. When you are supporting your baby from below, turn your forearm neutral and see if that feels better. What about all the burping? When you find yourself getting sore in the wrist from all of the back patting, try keeping your wrist straight and using the fulcrum from the elbow to move your hand back and forth. It’s a bit robotic looking, but your wrist might appreciate the break. Also, try and soften your hands when you can safely throughout the day. Is your back talking to you after walking and bouncing the baby around? 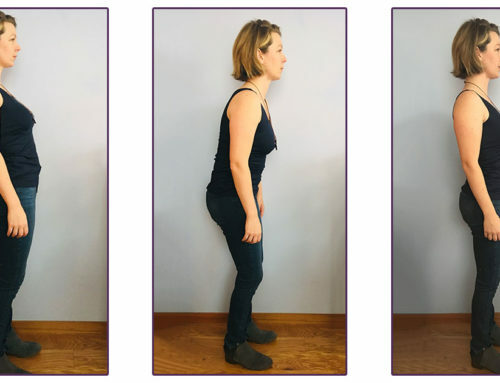 What if you find a more optimal standing posture? See what it feels like to bring your rib cage over the pelvis. We typically find ourselves leaning back in a posterior sheared standing posture. It is natural to recline a little so we can gaze at the baby and also it’s very similar to the posture many women adapt in the final months of pregnancy. If you have sensitivity at the sacroiliac (SI) joint, leaning back as you stand could make things worse. Instead, try bringing your rib cage over your pelvis in standing. This will put your abdominal wall at a more optimal length, offering a better mechanical advantage (more efficiency). This will also help your diaphragm and pelvic floor muscles work together. 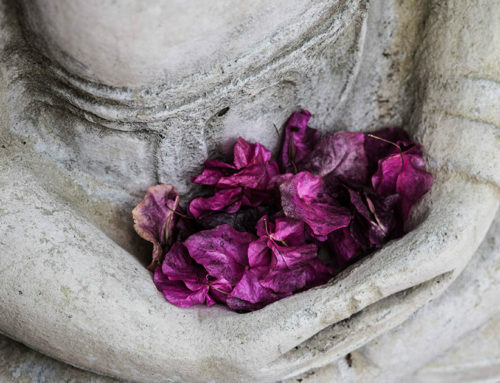 As you inhale both the diaphragm and pelvic floor muscles will release towards your feet and when you exhale they will both come back up towards your head. You’ll also use your gluts more, because your pelvis won’t be tucked under. Unfortunately I did not model a good shoulder blade position in this photo because I just couldn’t stand how cute this little nugget was! Ideally, I would like to see my shoulder blade tucked into my back a little bit more, but the most important thing is to move in and out of different positions so you don’t get too sore. For the babies who love movement, you can multitask your yoga practice and leg workout with Goddess Pose. Start standing with your feet wider than hip distance apart in Five Pointed Star. Turn your legs out slightly from the top of the thigh so your feet are pointing around 45 degrees out. Bend your knees and send your knees behind you, activating your hip external rotator muscles. Fun fact: the obturator internus muscle is both a hip turn-out muscle and a pelvic wall muscle. This means, as you strengthen your hips you are strengthening your pelvic floor! Stay here in Goddess Pose, or bounce at any point in the range of motion. Extra credit for trying to find your pelvic floor muscle contraction as you straighten your knees. Pair it with an exhale and it might be easier, but it’s really tricky to find your pelvic floor muscles when your legs are wide. Waist-height changing surfaces are easier on your body, but not always possible. 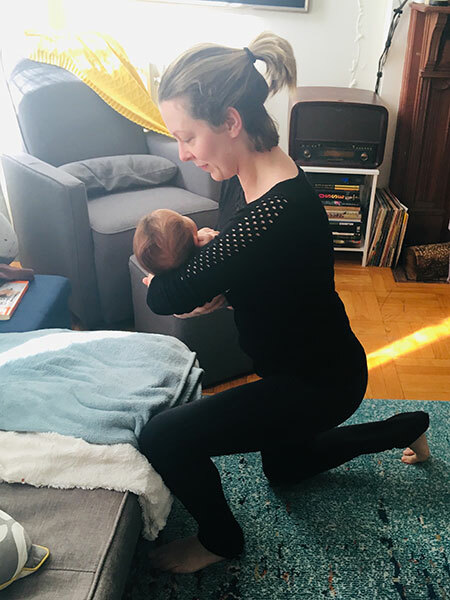 When changing the baby on a lower surface, squat or take a knee. Then use your hip hinge to place the baby down. When you hip hinge, think of staying long from your tailbone to the top of your skull. Allow the bend to happen in your hip crease. This is also what you want to do when you go from sit to stand. 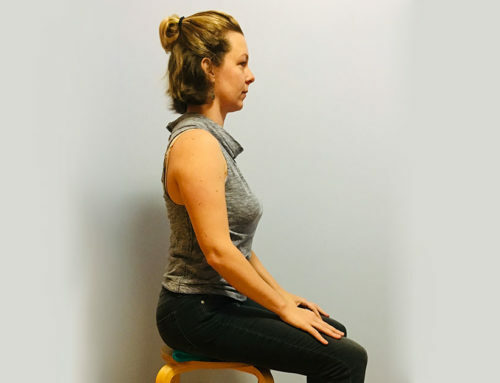 For extra credit when you transition from sit to stand, try and engage your pelvic floor muscles by doing a kegel as you come out of the squat position into standing. 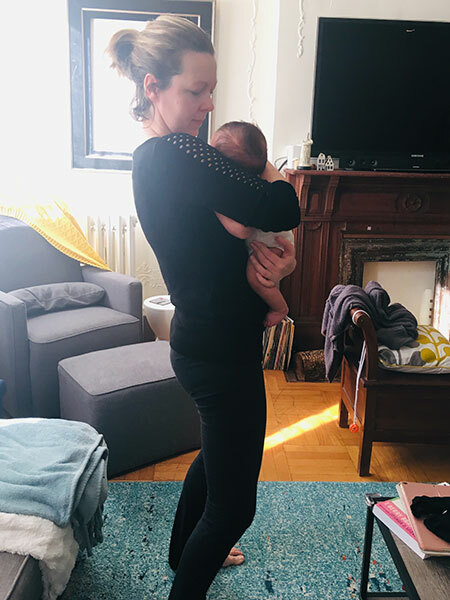 Like many parents of newborns, you probably vacillate between being tired of sitting on your rear end and being so tired you must sit on your rear end. With the former, multitask cuddling with a split squat. 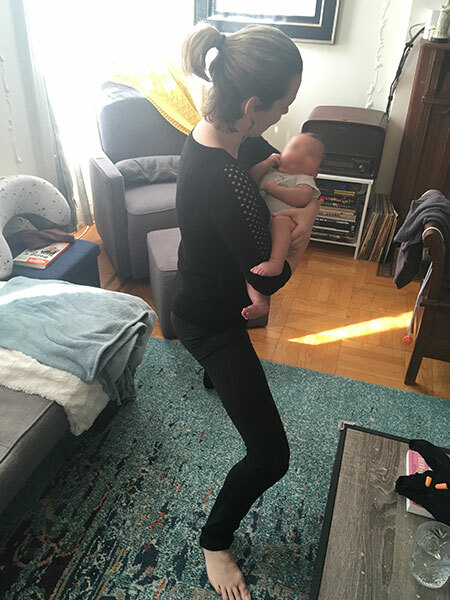 Start in parallel Warrior 1 or a split squat and make sure your base of support is wide enough that balance is not a concern while you are holding the little sweetie. Inhale as you send your back knee down towards the floor. Exhale as you straighten both knees. Extra credit for trying to pull your pelvic floor muscles up and in (kegel) on the way back up while exhaling. Even imagining it will help activate the neurological pathways! Warrior 2 is another glut activator. 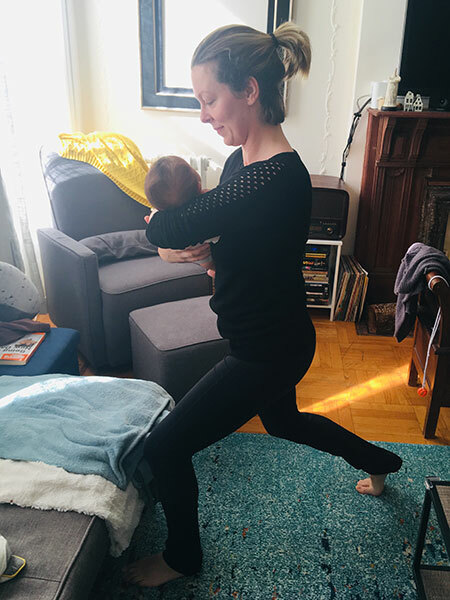 As always, make sure you don’t have balance challenges before trying this or any other exercise with a baby in your arms! Extra credit for inhaling here, then exhale as you straighten your knee. Repeat. Reverse Warrior Pose is a lovely way to open the side of the body. This little nugget was enjoying the rock between Warrior 2 and Reverse Warrior. 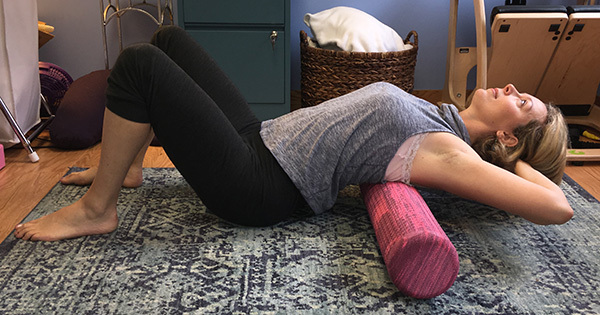 Foam rollers are useful tools for helping work out the aches after baby caring. Check out these blogs for more info about ways to use both the full foam roller and the half foam roller. 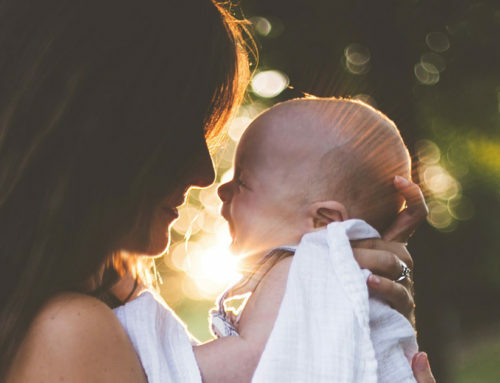 If you are a new mom or you know one, you understand the challenges of being postpartum. The body has gone through significant pressure changes and the core needs to learn how to work again. The pelvic floor muscles have been taxed with the weight of the pregnancy, never mind if there has been a vaginal delivery. 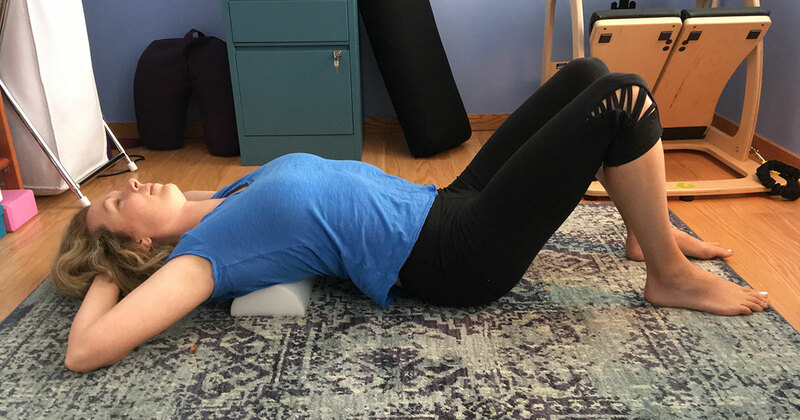 The abdominal wall muscles have been stretched out and potentially there is a diastasis recti abdominus (check out this blog on DRA). With all of these changes, how can you set yourself up for success? Bring awareness to how you are standing and sitting. Try and find yourself in aligned seated and standing postures whenever you can, keeping your rib cage over your pelvis. We are not trying for a rigid “perfect posture”, so increasing variability of movement is key. Already have back pain? Does your back is bother you when you slump? 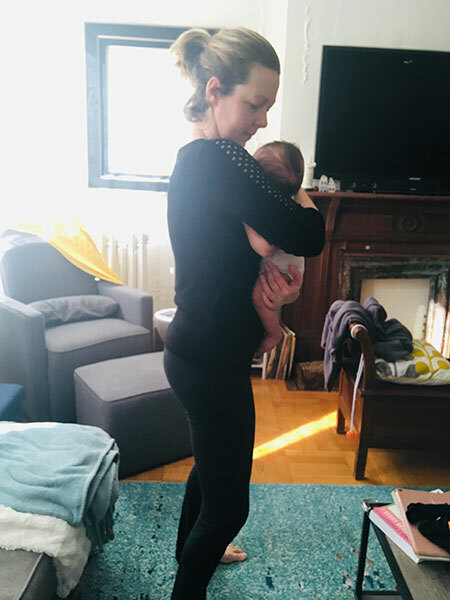 If so, you’ll want to limit trunk flexion (slump) as much as possible by adding pillows behind your back and bringing the baby up to you with pillows under your forearms. Grab more tips on finding your optimal standing posture and seated postures. If you are looking to strengthen the pelvic floor and core, check out Optimizing Bladder Control, which is specifically designed to increase core strength and coordination. 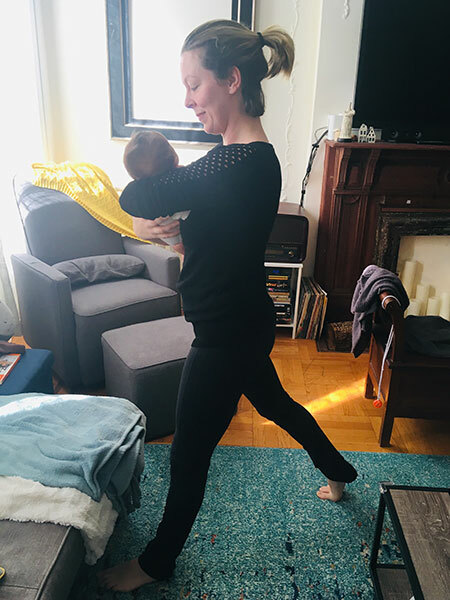 I created this for women who are postpartum, men after prostatectomy, and anyone interested in a gentle core stabilization yoga based home program. I hope you found this post helpful. Please share it with your friends and family! I look forward to hearing your feedback below. Thank you so much for this wisdom!!! My son is 9 weeks old and getting heavier by the day. Can’t wait to use these structurally sound positions with him!